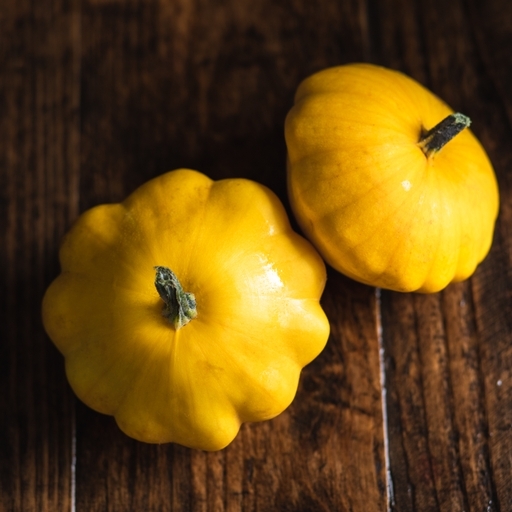 Organic patty pan squash. Mild and soft-skinned, these are a summer variety that really do look like little golden pies (or flying saucers). Harvested while young and tender, they taste a bit like courgettes, but with firmer flesh and a more buttery flavour that’s a good vehicle for herbs and spices. One of the few types of squash where you can avoid the fiddly business of peeling. Trim the top and bottom, and all the rest is good to eat. For an elegant summer centrepiece, serve whole, stuffed and roasted. They can also be cut into slices or cubes and braised, steamed, sautéed or roasted. Keep in the salad drawer of the fridge. Delivered straight from the farm, so wash before using. These sweet little squashes are grown for us by Clive Martin in the Fenlands. Clive is a third-generation farmer who converted to organic in 2006. ‘The best thing is being in tune with nature and producing top quality food in an environmentally friendly way,’ says Clive. He also grows our asparagus (one of the hardest crops to grow organically), and a colourful array of squashes in autumn and winter.